Recently Jeff Atwood published a blog entry about a retro piece of software that profoundly shaped his coding life. This reminded me of an experience I had with a now ancient piece of software, that had a similar impact. Back in the days of 4" monitors and luggable computers (yes, 4 inches, that's not a typo), my Dad encouraged me to use one of his favorite programs, an outliner. This was a time when people weren't quite sure what a computer was going to even be useful for. Was it just a fancy typewriter, or elaborate desk calculator? This outliner software suggested computers could be far more powerful: they could help you think, be creative and quickly solve problems. It was a software Swiss Army Knife before I knew I needed a software Swiss Army Knife (nowadays, emacs fills that role). This app had two other things going for it. First, it was my earliest encounter with software that traded ease of use for power and efficiency. I'd see this again when I jumped on the Unix bandwagon. Second, the manual that came with the software was valuable in its own right. I recall that smooshed between sections describing key strokes and how the software functioned were important insights and mind expanding philosophical musings. After reading the manual I didn't just want to use the software, I wanted to be a better thinker. But this all happened 20 years ago or so, and is hazy to say the least. For longest time I'd forgotten the name of this influential piece of software. Every few years it would occur to me to retrace my steps and rediscover this software, but I never had any luck doing so. Thanks to Jeff's article, I was inspired once again to look around. And this time, I do believe I've put all the pieces together. This life altering software was none other than MaxThink. I was delighted to see that it has a website, and that it's filled with the same software philosophy I remember. It's all about being the ideal tool for writers, planners and thinkers. Heck, you can still download and buy the software. I was also psyched to see that at least one dedicated user has some recent blog posts on MaxThink. That story has stuck with me since I read it nearly two decades ago. To this day when I face a challenge my default response is to follow that very advice: 1. make a list; 2. start on the first item. I've searched for this story over the years and never found mention of it on the web. I was beginning to think I had invented it. To see it printed in the manual is actually a bit of a relief. 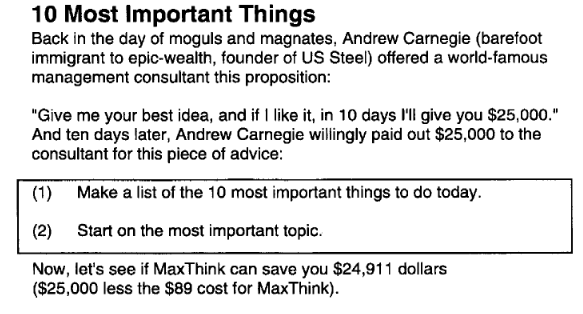 While my days of using MaxThink are behind me, the concept of leveraging a powerful outliner to get work done is alive and well. That's where emacs' orgmode comes in. Lately I've been using orgmode to track a number of different lists. And while I'm far from a power user on the subject, I do love that I'm getting to put my DOS outliner skills back to use. I'll have to re-read the MaxThink manual and really brush up on my skills. 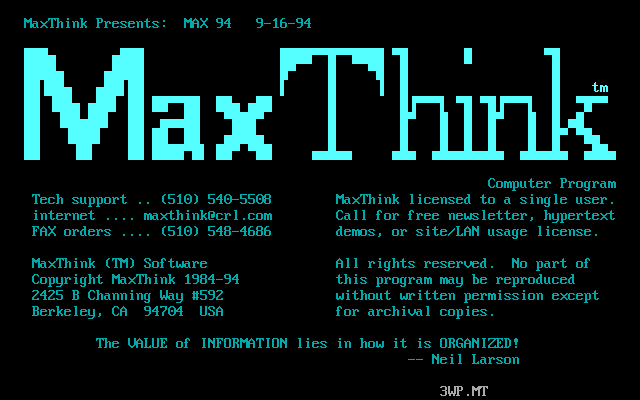 Incidentally, I had no idea that MaxThink is credited with being an early implementation of hyper-links. So not only did I benefit from this software, but anyone who's ever clicked on a link in a browser (that's you!) has too. So what early software influenced you? The DOS TSR https://en.wikipedia.org/wiki/Terminate_and_stay_resident_program opened by eyes to what a computer could do. This was before I used Linux and anything. Very cool. Very cool! I could see how that quircky feature could suddenly turn a computer from an elaborate typewriter into something completely new and interesting.